There hadn’t been a Christmas tree set up in my house in years, not since about ’91, when a then girlfriend talked me into it. About nine years later, in ’98, when my mom was living with me, I was walking through a neighborhood drugstore looking for something when I turned the corner into an aisle and saw this lonely little artificial Christmas tree that had fallen off the shelf. It was about three days before Christmas. This little tree looked to be the last one on the shelf. It had fallen into the aisle and its little wire branches were bent askew. It just seemed to call out to me in desperation, “Please take me home!” I couldn’t resist. I picked the little guy up and straightened out his branches. He had a neat little burlap wrapped base with a big red bow tie on it. It was just the cutest little thing. It stood about two feet tall. Perfect for the top of my TV set in the living room. I paid the six or seven dollars they were asking and took the little tree home. When I walked in, my mother looked at it and laughed. “What the hell is that?” she asked. I told her the story of the lonely little Christmas tree that had fallen off the shelf. I got some boxes of ornaments and a string of mini-lights that I had in the closet and commenced to decorating the tree. By the time I was finished, my mom loved it as much as I did. It brought a little cheer into the house that Christmas. I didn’t know it then, but this was to be my last Christmas with my mom. I hadn’t set the tree up since then, but yesterday evening, while taking my bags back out to the workshop to put them away after unpacking from the Holiday Party that I’d been to, I spotted the lonely little Christmas tree sitting in the back room of my workshop. I realized how much I missed the little guy, and the memories of that last Christmas with my mom. I grabbed it off the shelf and brought it inside. I set it up on my stereo stand in my kitchen (where everything else currently resides) and decorated it with the balls and lights and the blinking star on top. I’m looking at it right now. It sure is a pretty little tree! I wish I had a digital camera so I could take a picture for you guys. It’s bringing Christmas cheer into my home once again. I sincerely wish for all of my Cabin family and their families a HAPPY, HEALTHY, FUN, and SAFE Christmas 2007! This was originally posted at my Cabin In the Woods board. It’s now 2010. I’ve put that little tree up every year since I posted that story. It still gladdens my heart. I’m going out to my workshop to get it right now, actually. I’ll save this as a draft and add a pic before publishing it. So there ya’ have it, folks. The story of The Little Christmas Tree along with a 2010 update. Have a wonderful Holiday Season wherever you are and however you choose to celebrate! 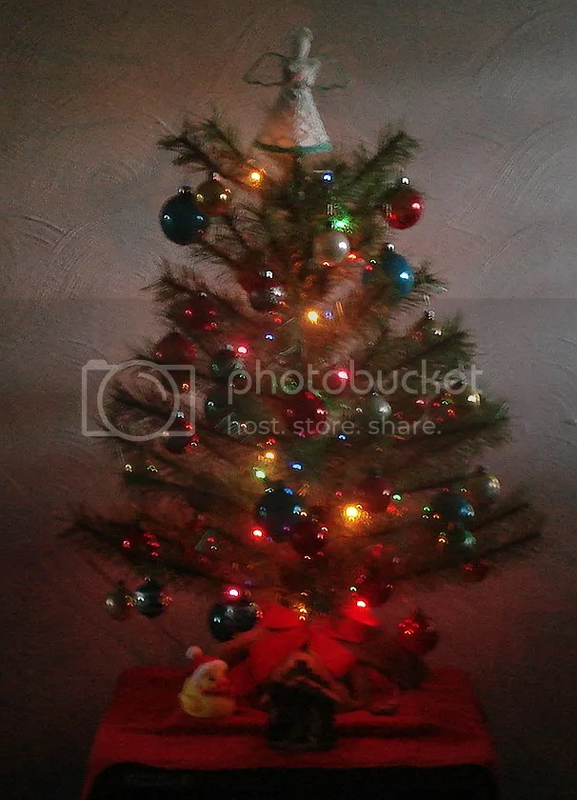 Posted by V. T. Eric Layton on 26 November 2010 in Story Time and tagged Christmas, mom, The Little Christmas Tree. You know, I like that little Christmas Tree. Not everyone can set up a big 8ft or even bigger tree and a small one like this presented on a nice stand does add a great accent to the other Christmas decoration. I always have a small (artificial) Christmas tree with decent light sitting in our bedroom. The bedroom usually wouldn’t be a room I decorate as much for Christmas as I do the living room or kitchen and this little guy I have just adds the perfect touch to the room. what is not made in China anymore? Even things that you would expect them to be made here in the US, e.g. like for my area typical Texas decoration, are made in China if you look at the sticker. I think that’s bad and does not help our current economy at all. But you know, money talks! Sorry it took so long for me to approve your comments. WordPress thought you were SPAM and had dumped you in that bin. 😦 Anyway, yup… the small Christmas trees are much easier to manage. I don’t have the ceilings for eight footers in this old house. Oh, and I was definitely being facetious about the Chinese imports. I think trade with countries that we cannot fairly compete with is destroying our own country. That’s a whole ‘nother can o’ worms to discuss at another time. I remembered reading that story at The Cabin and it is great that you updated it with a picture of the ‘cute’ little guy and posted here on your blog! Right back at you and yours, Fran. Have a GREAT one this year! Very nice story Eric. Thanks for sharing.